Mahindra's upcoming compact SUV, codenamed S201, comes with new production-ready body panels, taillamps, ORVMs and alloy wheels. The SUV will be launched later this year. 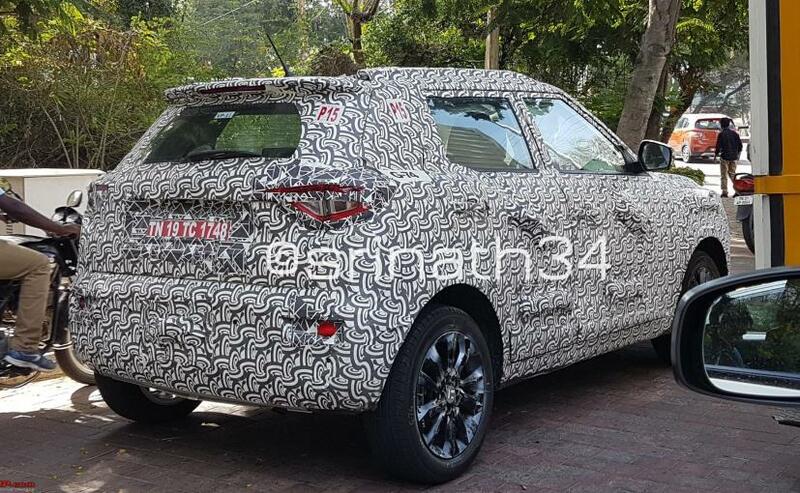 A near-production prototype of Mahindra's SsangYong Tivoli-based compact SUV was recently spotted testing in India. Codenamed S201, the compact SUV has been under development for a while now and the several production-ready parts that we see in these images indicate that the SUV might soon be ready for a 2018 launch. As opposed to previous claims, the Mahindra S201 will, in fact, be a sub-4 metre SUV, which means it will rival the likes of the Maruti Suzuki Vitara Brezza, Ford EcoSport and Tata Nexon. While the SUV is still heavily covered in camouflage, we see that the test mule is wearing production-ready body panels, taillamps, ORVMs and alloy wheels. Unlike the boxy taillamps that we saw on some of the earlier spy images, which were similar to the Tivoli's taillamp, the production version of the S201 will come with sleeker horizontal units which will also use LED lights. Furthermore, now the SUV comes with a new set of black alloy wheels and roof-mounted spoiler with integrated LED brake lights. Based on some of the earlier spy images, we know that the front section will resemble the Tivoli. However, similar to the rear portion, the front will also come with some heavy styling upgrades to differentiate it from its South Korean counterpart. We expect to see new projector headlamps with LED daytime running lamps, wide chrome grille, and a muscular front bumper among others. The cabin design is still unknown, but we expect the SUV to come with premium quality interior and smart features. Under the hood, we expect the new Mahindra S201 to come with the existing 1.2-litre G80 turbo petrol and 1.5-litre diesel engines. Having said that, Mahindra could surprise us with the new 1.6-litre diesel engine, and the new 1.5-litre petrol motor, which have been under development, although, we aren't keeping our hopes high. Transmission duties are likely to be handled by a 5-speed manual and possibly an AMT unit.